The search for a sugar-free accompaniment to an afternoon tea continues. 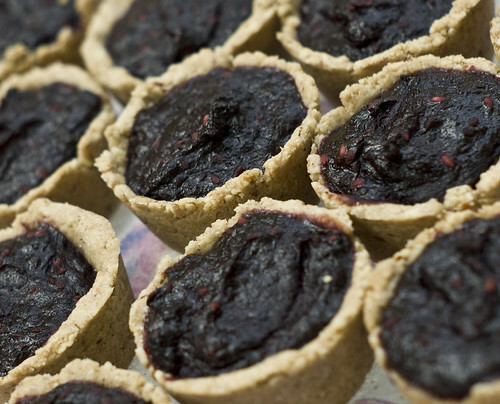 This time, I’ve come up with a tartlette that packs a blackberry punch. In this recipe, I cooked down about 3 cups of frozen blackberries and added a cup or so of applesauce (using up some of last year’s canning) and a few dates. Once the mixture was thick enough to hold its shape, I spooned the mixture into crust cups that were made with about a cup of flour (half whole wheat, half white), 1/4 cup of butter, a handful of ground nuts (in this case, toasted pecans and almonds) and just enough water to help it hold their shape while being pressed into the mini cupcake tins. I then baked them for 20 minutes in a 400º (F) and let cool before devouring. I’ve started knitting Virginia some knee-high socks. 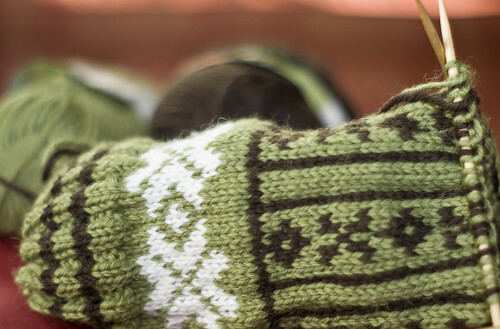 These are Nancy Bush’s Norwegian Stockings, knit using Smart yarn. Obviously, I’ve only just started these, but I’d like to draw attention to the fact that the posts from here on out will now be focused on life as we like it – full of cancer-free, scratchcrafty goodness. OOh pretty! I’ve never heard of Smart Yarn. I’ll have to look it up. They sound like a fruit version of “Tassies” – those ones usually have pecans or walnuts. Yummy!